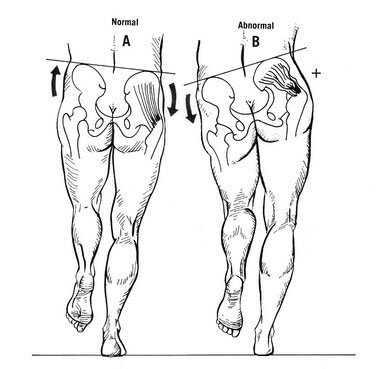 The Trendelenburg Test, or Trendelenburg Sign, is commonly used in orthopedic examinations of the hip to test for impairment of hip abduction. A number of different structures or conditions may cause this test to be positive. When seen in walking, this is called Trendelenburg Gait. The test is performed with the patient in standing. The patient is asked to stand on one leg, the affected leg, by lifting the unaffected foot/leg. This test is considered positive if the pelvis drops on the side opposite the affected hip as the patient lefts the unaffected leg. If the pelvis remains level, the test is negative. The pelvis drops on the unaffected side because the abductors on the affected side are unable to contract to hold the pelvis steady on the fixed/supporting femur. The patient may side bend the trunk dramatically towards the affected side to prevent lateral tilting of the pelvis. In this image, the abductor mechanism on the right is compromised resulting in a positive Trendelenburg Test / Trendelenburg Sign. The Trendelenburg Test is fairly accurate but is not necessarily specific to any one structure. 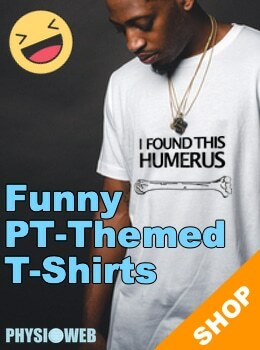 There are often multiple structures involved, or there is a nerve palsy due to poliomyelitis affecting the Superior Gluteal Nerve, which innervates both the gluteus medius and the gluteus minimus. 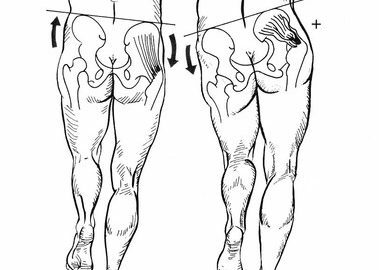 The hip abductor muscles (gluteus medius and gluteus minimus) may be damaged or may be detached from their attachment point on the greater trochanter of the femur. A fractured neck of the femur, damaged head of the femur, or dislocation of the head of the femur may also be to blame.